A commercially valuable crop grown in the southern United States, the cotton plant requires at least 160 frost-free days in sunny, fertile soil to reach maturity. Although five types of the semitropical plant grow around the world, each type must complete a similar life cycle. The types include Egyptian, Sea Island, American Pima, Asiatic and Upland. In the United States, 14 Southern states grow Upland cotton, while American Pima grows in Arizona, California, New Mexico and Texas. 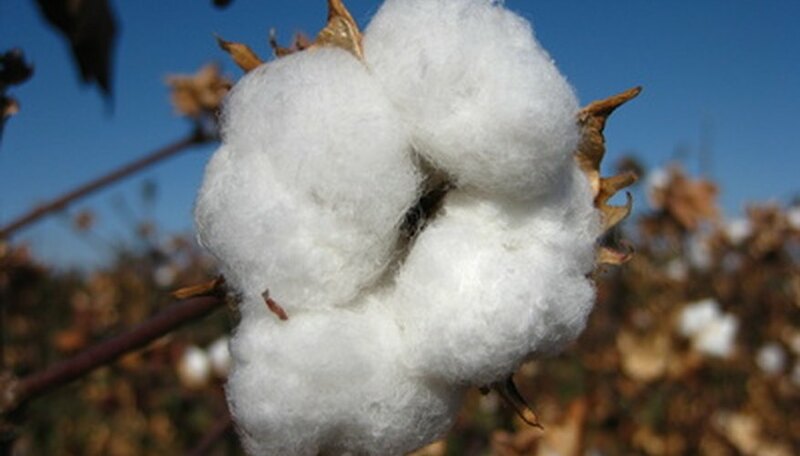 Cotton plant seeds come from mature, harvested cotton fibers picked in the field. Machines called pickers or strippers comb the seeds out of the fibers. The cotton gets compressed into bales and sent to market, while the seeds are saved for planting or for use in cottonseed oil or in livestock feed. All cotton plants start as seeds planted in moist, fertile soil, preferably in soil reaching temperatures above 60 degree Fahrenheit for 10 days before planting. Five to 10 days after planting, the first two leaves appear on the seedlings. These leaves, called cotyledons, absorb sunlight, converting it through photosynthesis into food the plant requires to grow. Meanwhile, the roots of the seedling are rapidly burrowing into the ground, reaching 9 or more inches long, in preparation for stabilizing the fast-growing plant. In two to four weeks, a second set of leaves appears, and the plant starts to grow very quickly, adding more leaves and growing from 2 to 5 feet tall. As soon as the flower pollinates, a pod, or boll, starts forming. For the next 20 days after the flower blooms, the plant sends most of its nutrients to the boll. The boll contains more than 30 seeds from which the cotton fibers will grow. The fibers grow very quickly in the boll, reaching their maximum length in 15 to 25 days after pollination. Once the fibers stop growing, they start filling with cellulose, a process that takes 24 to 40 days. When the bolls finish filling with cellulose, they start to burst open, spilling forth their cottony contents about 105 to 130 days after planting. The cotton dries out and fluffs up until it’s mature and ready for harvesting.